#MakeOverYourMornings: The #5Things I Needed Most. I’ve been circling. Imagine toilet bowl with me. Yes, it’s felt that bad. Stress mounting to the point of spiraling out of control, and no matter the amount of know-betters and best-intentions I’ve truly been in constant conflict with myself. Disclosure: This post contains affiliate links, which means that at no additional cost to you - I may get a small commission. However, this post is NOT a paid advertisement; you will have to read through to the end to see my #1 and #2 reasons why this was written - neither of which are to make money. I was going through one of the roughest days I’ve had in a very long time. And no matter how much I could pray through and ask for more faith to trust, at the bottom of everything I was feeling was this demand to know the source – was this a test to make me stronger? Or a temptation to see me fail? Should I beg for mercy, wait, and endure? Or should I fight back, get tough, and push through? I felt like I was at the fever pitch of what my self-control could handle and yet there was more coming at me than I felt like I could bear. I couldn’t see clearly to the end of the day, let alone the end of the problems. Like I said in this status update, I initially put the thought of signing up for the course out of my mind because – I’m a generally organized person. I get up very early, I have a good morning routine, and I’m generally satisfied with how I spend my personal time. Then I took a good look at myself, and I was still in my pajamas and it was nearly 10am. I had no clue what I was going to do next, eat next, or how we were going to just-make-it-to-lunchtime. Oh, how my pride is sneaky. Sure, my personal time was in good order, but my homemaking and scheduling for the kids needed some direction. I was operating under good intentions, but not goals and plans. Pride, and the fear of change, had me believing everything was going well. I was making it to the end of every day getting some things accomplished but I didn’t have anything to measure it against. How does the saying go? The path to failure is paved with good intentions? Facing my pajama-clad-self, I realized again that in order to grow in discipline and self-control I would have to accept this help. The right time feeling dawned. I wanted to get perspective – to take an inventory of my responsibilities, habits, routines, schedules, and goals. Goals – I have grown in baby steps by following Crystal Paine of the MoneySavingMom.com (MSM) for years now. The fact that this course was created by her was a big motivator for me to try it. Her journey with goal setting and follow through has been encouraging and transparent on her blog. When I have tried what she has recommended I have experienced growth and rewards. In the course, she goes in depth to explain the in’s and out’s of goal setting and keeping. She’s written a 64-page handbook to go along with this course including 6 unique printables. Goal Sheet: written out, pictured, and set as lock screen (so I can’t forget about them). Personal – The video portion (which is professionally done) of this course is so personal. Crystal does such a great job at creating a warm and welcoming feel to each day’s video – and her true passion for helping others is communicated beautifully through her friendly words and attitude. I’ve read MSM for years like I mentioned in #1, and I’ve watched her live out the tips and principles that are detailed in this course. So can you just read her blog and find the same practical helps? Not really. 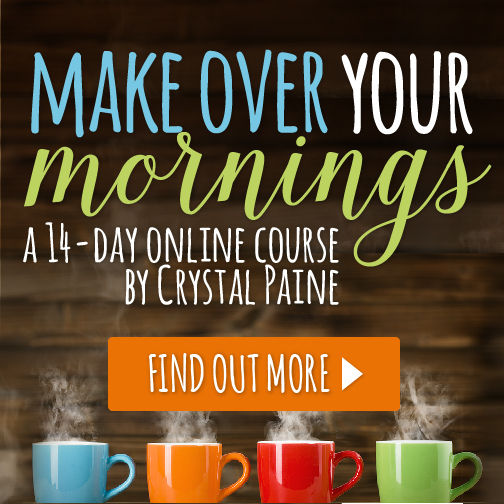 The value of this course is Crystal’s voice – her telling in detail how she has lived these lessons one-by-one. Her advise is personal but the take-away is unique to me. She leaves the application both specific enough to know what to do, but the advise allows me to apply my own how to do it. Approachable – For each area of my life, this course speaks into both my strengths and weaknesses. My weak and lazy areas feel changeable. I’m inspired to make drastic change while also fine tuning areas where I thought I was put together. There is so much in the course – applying to every level of personal discipline – that I plan to go through the course again on a bi-yearly basis (or maybe more) when the seasons of life change and a new approach to accomplishing goals is necessary. Balance – One of my weaknesses with balancing all of life’s responsibilities with appropriate goals is actually a strength – my passion. When I love something or I am filled with a drive to get something done, I take large chunks of time to devote all my efforts to doing it with all my heart. This is great and I have benefitted time and again from the large strokes of change and accomplishment. The down side is that it is unbalanced. The other areas under my management take a backseat until they get unmanageable (coasting only lasts so long in any one direction) and I must change my focus to the next area. If you can relate, then you know how it feels to try to hold back or stop short of the finish line just because of other demands. But such is life. I’ve learned that no matter if I’m on a roll with writing in the morning, my kids still must have breakfast and we all must get dressed and start the day. Some daily demands cannot go on hold just because inspiration or passion strike. So my #5 reason why I’m enjoying the #MakeOverYourMornings course is a big one because it’s helping me learn how to balance not just how to hold back. So why would I take the time and effort to share this with you if I’m not looking to make a fortune off of it? First, this course has inspired me to embrace the confidence of knowing that I have authority over my own life and choices. I needed to consciously choose to put my anchors back in something, and this course has helped me take significant steps in goal setting again. Now, please don’t jump into this course if you want Crystal (or me) to change your life for you! It’s easy to fall into criticizing someone who is doing well with their goals when I’ve tried and failed – if I had been in that attitude then this course wouldn’t have helped me at all. Attitude and anchors mean so much to me in having a positive life. Second, I love being apart of this big community where together we can make a significant difference. As I shared on #2, the accountability of going through the course and choosing to engage with others has been very helpful and encouraging to me. Plus, on the launch day for this course Crystal gave 25% of profits to a great cause. Read her post to find out more about behind the scenes of the course and the cause. I hope you’ve enjoyed reading a little bit about what’s helping me change, and I also hope you’ll consider taking this course to see for yourself. Also, I hope you’ll take a minute to read my latest post: Teaching Money Management to Kids. And as always – thanks for reading. For more encouragement from The Home Learner and a free PDF guide to writing your own Parenting Purpose Statement, click here. Great article. I can so relate. I’m looking forward to getting back from vacation so that I can get started on this…..but I mean, sort of, because also VACATION, ah! Are you in the Facebook Make Over Your Mornings group? I’ve been commenting on the videos via Facebook, and the community just in the comments are helpful. Women truly sharing and growing from this course. Welcome back – recovery from a vaca can be tough. I hope you love it as much as I do, Davonne! Thanks for taking the time to read my post about it. 🙂 Be sure to come back and ask questions – I would love to be of help, anyway I can.